The inbounds pass is contested. The defender of the inbounds passer makes the pass as difficult as possible by yelling, jumping up and down, waving her arms, and staying in the passing lane. The other defenders attempt to prevent the inbounds pass to their checks. Each step taken away from a deny defender is covered by a slide step, the first step taken towards the defender is covered by face guarding the attacker, and the second is covered by denying on the other side. Note that in this example X5 is in a position to intercept a long pass. 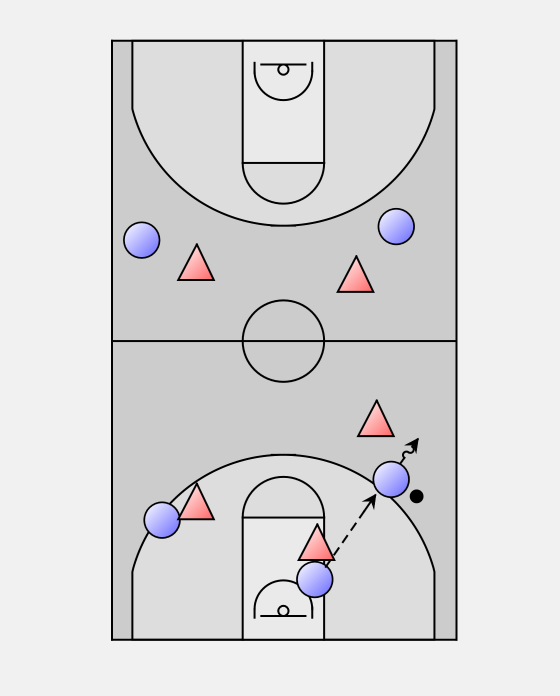 Once the inbounds pass has been made, the on-ball defender pressures and contains the ball handler (head on the ball), trying to make her put the ball on the floor then pick it up again for a "used dribble", or forcing the dribbler to change directions with the ball as often as possible. All defenders must see the ball, and every pass is contested. A defender whose check is one pass away from the ball plays "on the line" between her check and the ball in a closed, deny stance with one arm in the passing lane, and "up the line" one-third of the distance. A defender whose check is more than one pass away should be well off her, clogging the middle of the floor in an open stance, and below the line in a flat triangle position. Attackers will be tempted to pass over the defense. The key is to pressure the ball so that passing is difficult, and for defenders off the ball to anticipate and intercept the pass. If the attackers beat the press, the on-ball defender recovers and tries to slow down the ball. The other defenders sprint back to the paint to protect the basket, and then pick up open players (build the defense from the inside out). If the ball handler beats a defender on the dribble, the nearest defender can step up to stop or slow the dribble penetration until her teammate gets back into position. The helper then recovers to her check (hedge or help and recover). Only one defender should help. 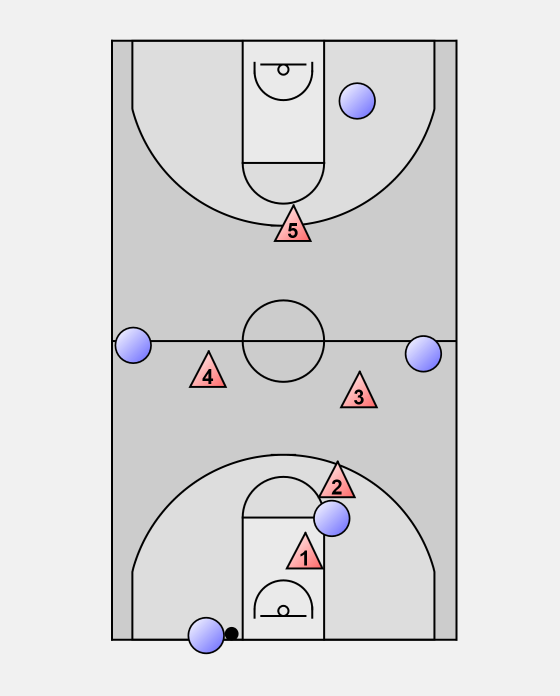 24 is a containing defense intended to keep the attackers under continuous pressure and allow no easy baskets. 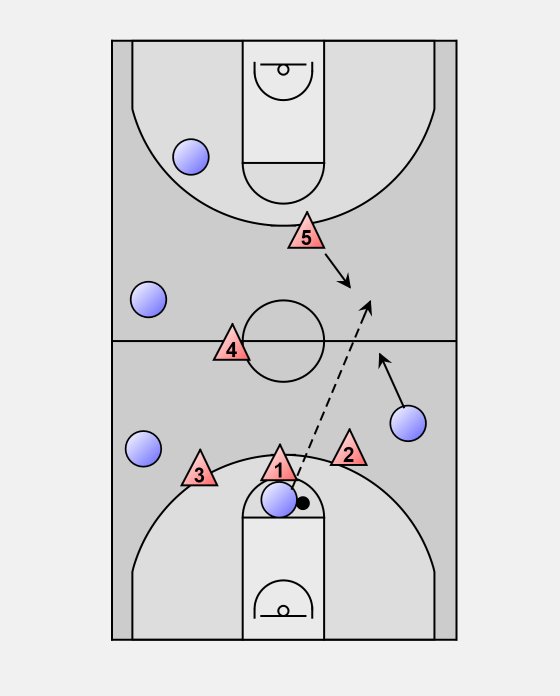 It does not emphasize trapping, since that is a gamble, and the opponents can avoid traps by clearing out and letting one player bring up the ball. 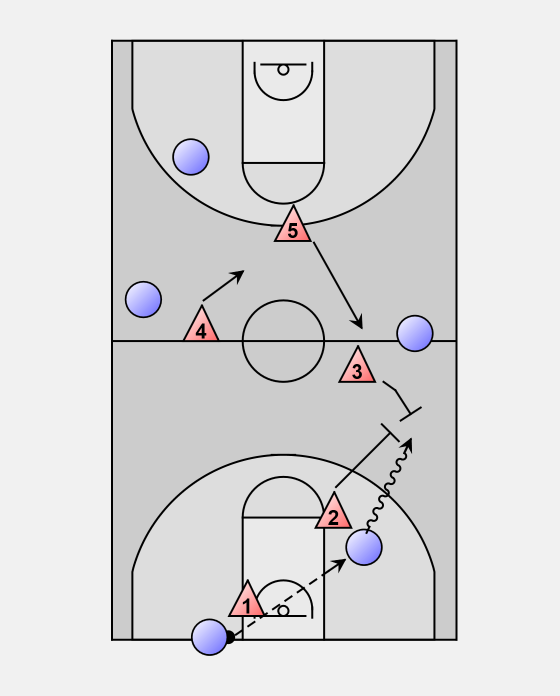 However, the defense will trap when the offence makes a mistake; for example, an attacking ball handler gets caught along the sideline. 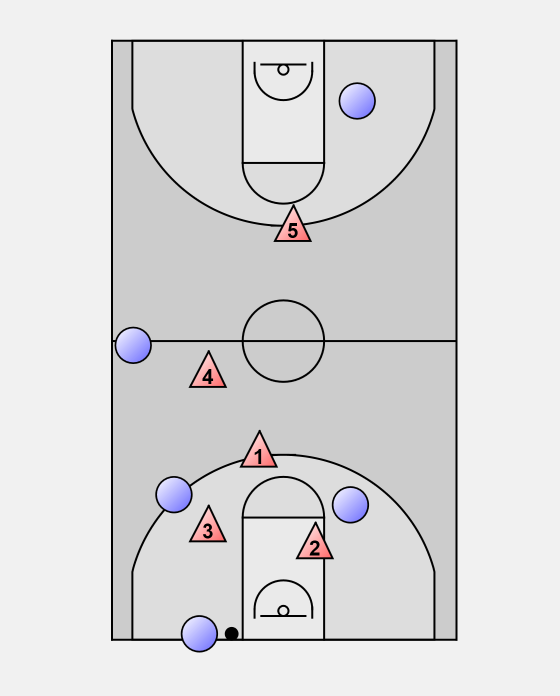 Here X3 releases from her check when the ball handler is three strides away to complete the trap with X2. X5 rotates up to pick up X3's check, X4 drops back to play the gap between the two deepest attackers, and X1 denies a pass back to the in bounder. There should never be more than two defenders trapping the ball; otherwise, too many attackers are open. 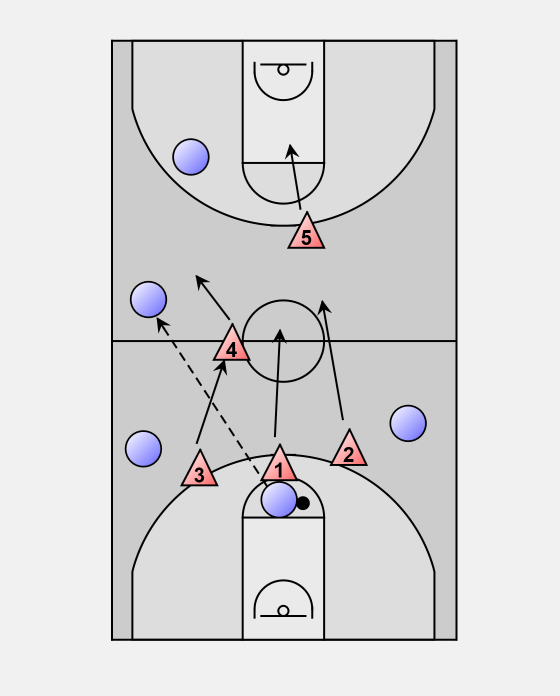 With the "Shortstop" option, the defender whose check is the inbounds passer plays between the ball and a receiver, while the receiver's check plays behind to complete a double team. X1 can be in a closed deny position, or optionally be in front of and face the intended receiver. 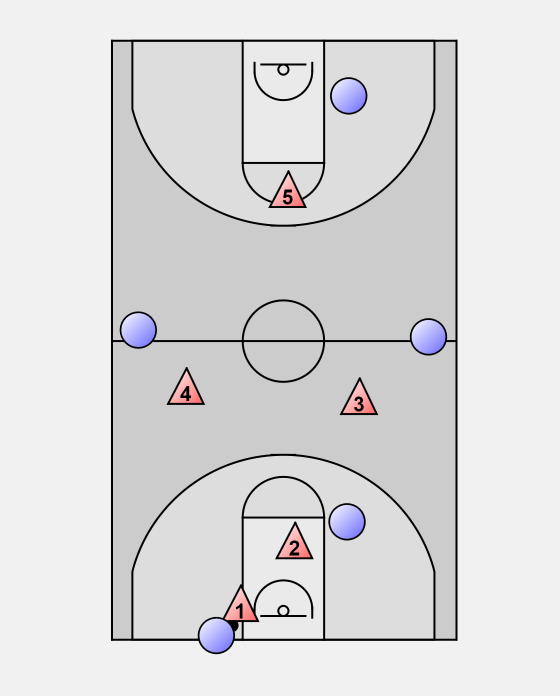 If the inbounds pass is made, X1 should recover to guard the in bounder. 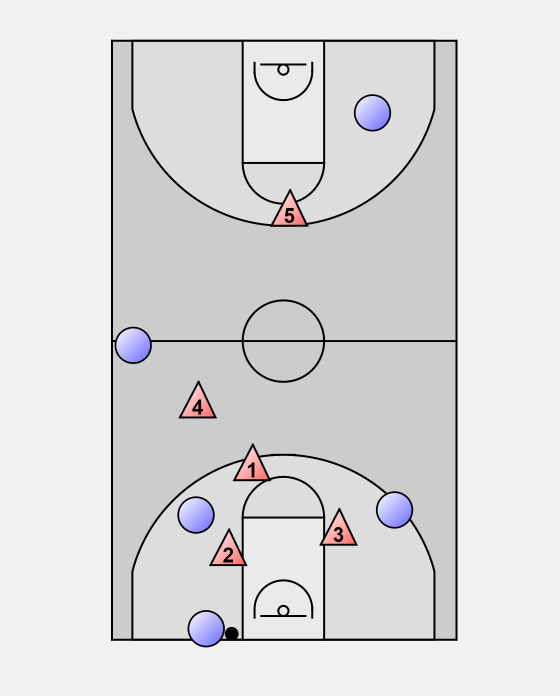 With "Centerfield", the player usually guarding the inbounds passer plays at the top of the circle to intercept any medium lob pass. X1 cheats ball-side because the backboard prevents a lob to the weak side. X2 and X3 can overplay their checks to deny passes. If an inbounds pass is completed, X1 would recover to her check, the inbounds passer. Centerfield gives the defence the look of a zone, which can confuse the opposition. The defender of the in bounder (here X1) moves into her backcourt, allowing the other defenders to overplay their checks without worrying about a pass over the defense. 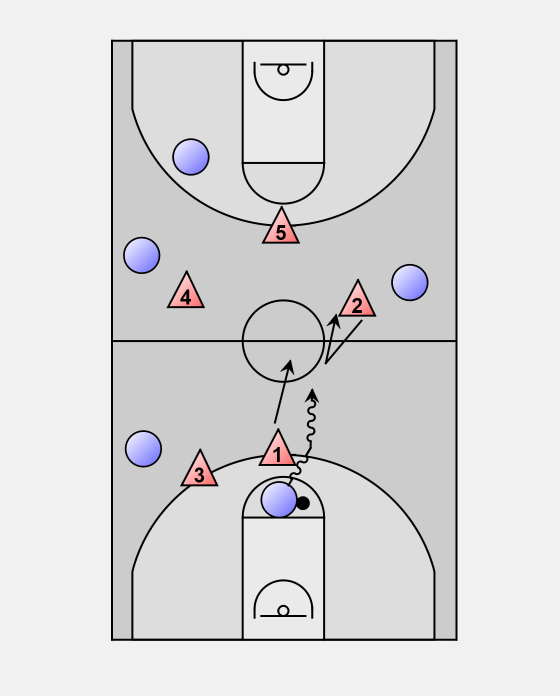 If an inbounds pass is completed, however, the press is broken by a pass back to the in bounder. 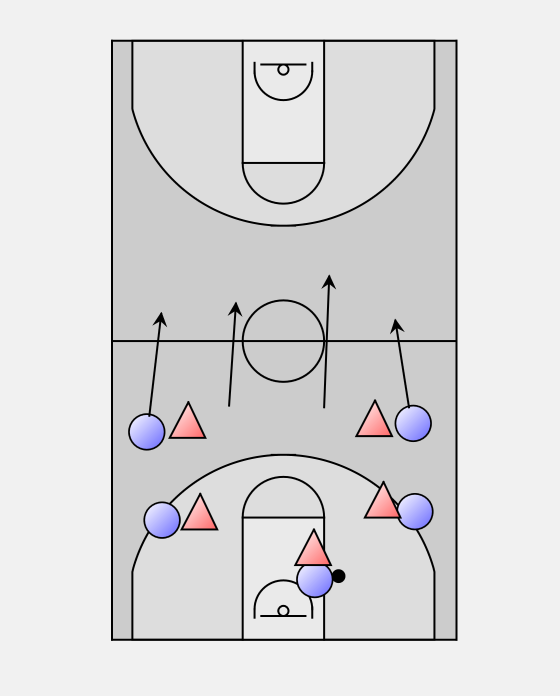 If the opposition plays with a deep attacker, her defender will also be deep, preventing a full court inbounds pass. X1 can then freelance in the front court, e.g., double-team a primary receiver (shortstop) or play centerfield at the top of the circle. 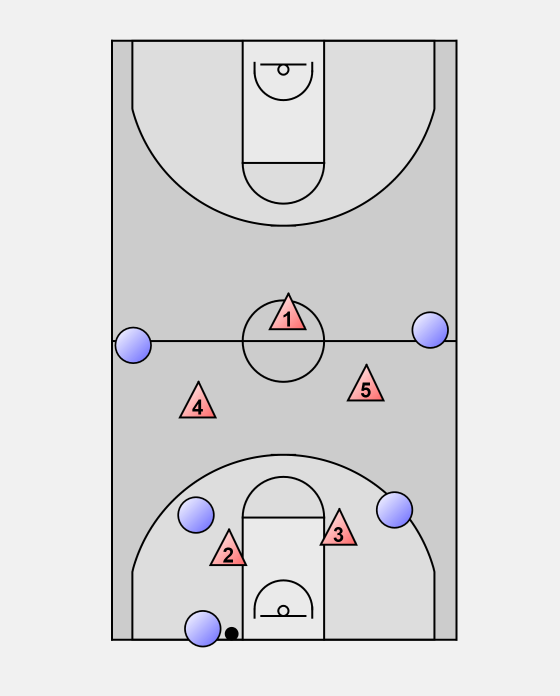 Full court pressure can also be applied after a missed shot ("Green" option) to disrupt the opposition's fast break, give the defense more time to set up, and generate steals. The nearest defender ("jammer") aggressively pressures the opposition rebounder, delaying a quick outlet pass. The other defenders match up to closest attackers to deny an outlet pass and sprint release to prevent long passes up court. Defenders switch back to their checks at an opportune moment in their backcourt. If each player on your team is her check's check (they defend each other), then quickly picking up all checks after a missed shot may be feasible. If an outlet pass is made, it should be to a ball handler coming back to the ball - don't let her "catch and go". 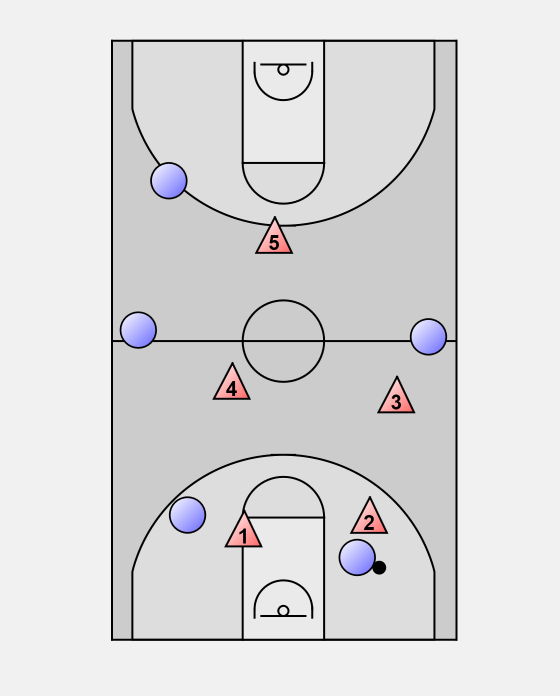 The on-ball defender then forces the dribbler sideline, or into making 3 or 4 changes of direction to slow her down, and smothers the ball handler if she picks up her dribble.